The original concept of pre-orders came around 2000. When popular items arrived in stores, they would fly off the shelves, making it hard for people to easily obtain them. Companies saw this issue, and decided to try the equivalent of a “reserve” system. You’d pre-order a copy of a product, and on release day it would be at your door, just like the other people who lined up at stores. The gaming industry was quick to adopt this model. Massively popular games like the Call of Duty, or the Halo series would no longer require lines outside the door, and everyone could enjoy the game when it launched on release day. Of course, while this was originally a benign way to allow companies to gauge demand and allow customers to get the products they want without fear of being too late, pre-ordering soon evolved into a wholly different animal. Today, while pre-orders are still prevalent and relatively popular amongst the gaming industry, many a consumer look down upon pre-orders for a variety of different reasons. From complaints that some developers rip out parts of the game specifically to guarantee that customers will pre-order their product, to games releasing clunky or unfinished without any fix simply because the developers have already made their money, consumers have had their pains with pre-ordering games. The main gripe that many people have with pre-ordering video games comes down to the signal that they give developers. When someone pre-orders a game, the developers who haven’t even finished the game yet are given a signal that this particular person is perfectly fine with whatever state the game will be at launch. Instead of having a complete game with all the features and qualities that a consumer would expect, developers could simply release a barebones imitation of a game and leave it at that. Why would they put forth more effort when they’ve already received your money? There have been several examples where developers have done some sketchy actions in the act of guaranteeing more pre-ordering, and they’ve all received overwhelmingly negative responses from their fanbase. A fiasco that many would like to forget was the infamous Deus Ex pre-order scheme that was cancelled after fans were incensed. 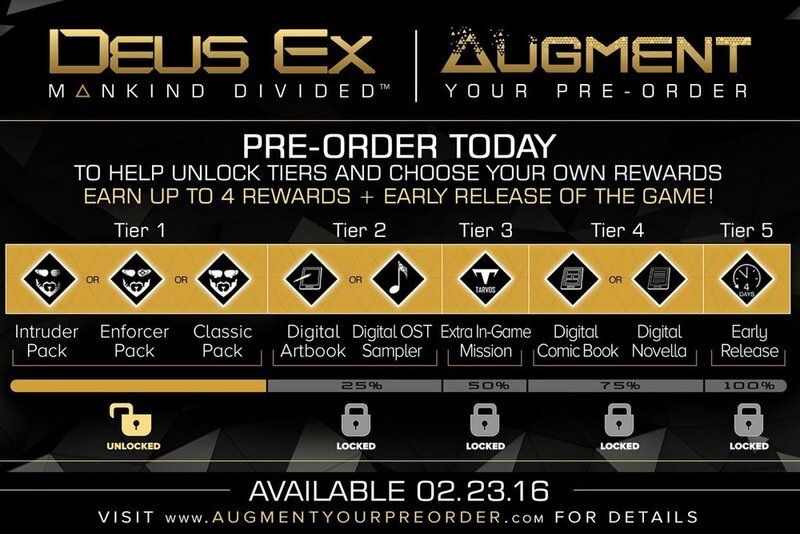 Developers Square Enix attempted to implement a tiered reward system for customers who’d pre-order their game, Deus Ex: Mankind Divided. Rewards ranged from extra in-game missions or digital soundtrack samplers, with the top reward being an early launch. Customers were infuriated, with complaints ranging from the developers locking content behind this system, or that Deus Ex was removing in-game missions and locking them behind pre-orders, to the complaint that they were “holding the release date hostage”. Square Enix cancelled the program within a month, apologizing for the frustration and ire that they’d caused gamers. This fiasco remains a terrifying example of how blatantly some companies would go to ensure consumers would pre-order their game, and guarantee revenue. The second reason behind why consumers in the gaming industry dislike pre-orders is that in some cases, the game may not live up to expectations. This relates to pre-orders as a key point of how consumers can let developers know what is a good game, or a bad one is with their wallets. If a game launches littered with bugs and other issues, reviewers would note the issues, and gamers wouldn’t purchase the game. However, with pre-orders, developers can simply dangle the promise of otherworldly features and qualities, and consumers can easily be seduced into buying a game that possesses none of those promises. A bad game can have excellent marketing, building hype and anticipation for a game that may not “deserve” that sort of attention. Games will subsequently pre-order the game only to be burned by the actual game. While some developers apologize, and continue to work on the game, it nonetheless is a sign that some companies are willing to release incomplete games, as “Works-in-Progress”, marketing features and events that may not even exist. The most infamous example of a runaway “Hype Train” that burned many consumers is No Man’s Sky. No Man’s Sky shows everyone that while hype and excitement over games are definitely fine, sometimes, that enthusiasm may be unfounded. Developed by indie company Hello Games, the game boasted a procedurally generated open world, and boasted a completely unique exploration experience unlike any games seen before. The developers promised a great deal of features that were going to be in the game, like high quality explorable planets, multiplayer. Gamers were excited, expecting a massive success. Leading up to the release, the developers were beginning to realise that their ambition was beginning to bite back. They continued to push on, but when the game released, the gaming community quickly turned against Hello Games. The playerbase of No Man’s Sky, from release to August 2016. Note the massive drop. People were outraged at the lack of qualities, features, and very rough version of the game they’d received, not the polished exploration experience they were promised in marketing and promotions. Hello Games had unfortunately omitted so many features that a Reddit user compiled a list the length of a college essay of what the developers had failed to follow up on, further infuriating the gaming community. While initial sales and pre-orders were high, within a few months the PC playerbase had sunk from a 212,000 concurrent player count to 2000. Gamers everywhere were burned by the game, and other than requesting a refund, there was no way they could recoup their losses from pre-ordering. While games can promise a great deal, if they don’t live up to them when it comes to launch day, consumers should not buy the game, yet pre-orders live off of the hype and excitement that many gamers have, sucking them into a fantasy game that could never live up to their expectations. With two prominent examples and many others, one would think that pre-orders would be starting to die down, but that would be incorrect. Plenty of games in 2018 still offer pre-orders, from Assassin’s Creed Odyssey, to Red Dead Redemption 2. Even Destiny 2, a game which received a ton of post-launch backlash continued to add pre-order bonuses to their DLCs. While they do receive some criticism, for the large part, people seem to have accepted pre-ordering as a necessary evil. If you really want a complete game, you’re going to have to put some trust, or even faith that the developers will stay true to their word.